When Jersey Shore star Nicole “Snooki” Polizzi stepped onto the VMA white carpet on Sunday night, a collective gasp arose amongst millions of viewers. Her hair was sleek, straightened, newly-darkened and had a shocking lack of volume or height. That’s right, the girl who helped bring the word “pouf “into our national lexicon — and even spoke of marketing a Snooki-branded Bump-it — has moved on from her signature hairstyle. In a white carpet interview with MTV, Snooki said that she’s been sporting a pouf since the age of 16, and she felt it was time to “move on and look more adult.” At the VMAs, we got our first look at “adult” Snooki. Her hairstyle was smooth, her red highlights had been removed in favor of softer, caramel-colored ones and she had a new set of eyebrow-grazing bangs. We have to say, the new look is definitely more mature. To take her look one step further into, say, work appropriateness (not that Snooki is joining the corporate world anytime soon, but maybe you’d like to wear Snooki’s hairstyle to work), she should consider a more subtle lip color. What do you think of Snooki’s new hairstyle? Is it an improvement on the pouf? 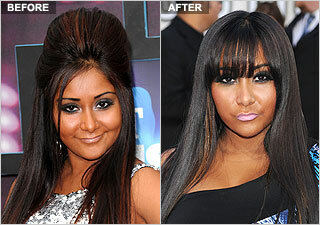 See how Snooki’s hairstyles look on you in the Makeover Studio!